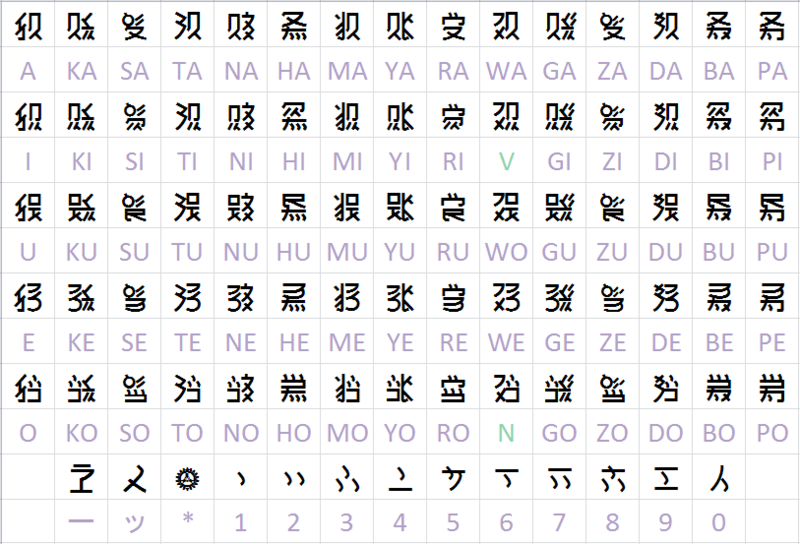 Xillia's writing systems look syllabory, like Japanese's kana tables, but it is a little more complex than that. Only Rieze Maxian will be used as reference for the explanations, as both systems are more or less the same - the only difference is that Rieze Maxian looks a bit more cursive than Elympion. Syllable blocks are formed by a fusion of vowel and consonant symbols, a bit like in Korean. For example, the syllable "KA" contains the symbol for "A": and the one for "K": . Group 1 (the consonant symbol is on the left of the vowel symbol): D, M, T, W, single vowel symbol and exceptions*. Group 2 (the consonant symbol is on the right of the vowel symbol): G, K, N, Y. Group 3 (the consonant symbol is on top of the vowel symbol): R, S, Z. Group 4 (the consonant symbol is under the vowel symbol): B, H, P.
(*) Exceptions: the "vi" syllable, which also serves to represent the "v" sound in general, represented by W+I; the "wo" syllable, represented by W+U; and the Japanese "ん/n" sound, represented by W+O. The vowel symbols' look changes a little according to whether the symbol is placed horizontally or vertically in relation to the consonant symbol. is used to indicate a long vowel, like the ー in Katakana. is used to indicate a double consonant, like the small っ/ッ in Japanese. are slight variants of YA/YU/YO. They are used like the Japanese small ゃ/ゅ/ょ when forming diphtongs (ex: きゃ/kya rather than きや/kiya). Numbers have unique symbols, as shown in the table. The Xillian writing systems were designed to work with the Japanese language, and so some knowledge of Japanese is needed to decipher the inscriptions in the game or to try and write in Rieze Maxian or Elympion. References: Tales of Xillia Official World Guidance Book p.30. Pixiv members Tona and Miji have made fonts of the two writing systems. You can download them together here. /!\ Note: your keyboard must be set to "Japanese" for the characters to appear. 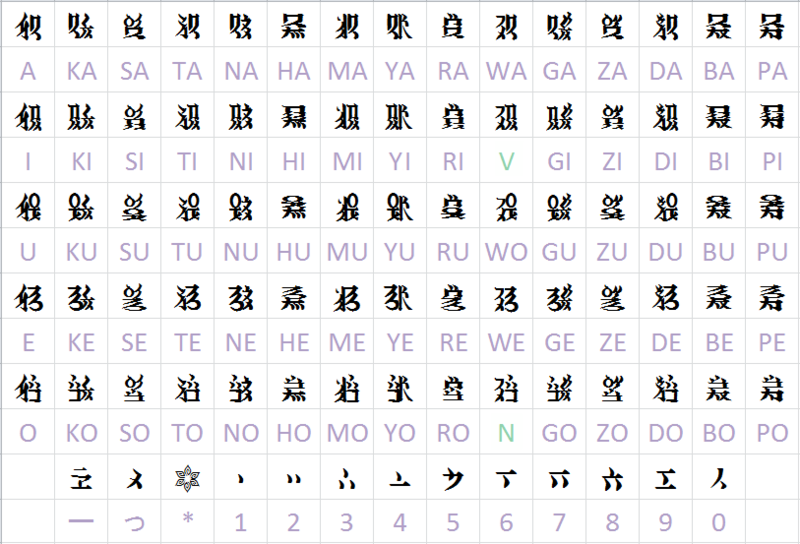 Some characters ("yi", "ye", "we") are missing from those fonts and there are some mistakes (the character for "n" appears when you enter "ga", and "te" for "to" with the Elympios font). EDIT: Elympios font fixed on the "ga" issue here. - Note: if you can't see the tables well, here are links to the pics: Rieze Maxia and Elympios. Long Dau is the court language of Long Dau nobility and Wingul’s mother tongue. It is an oral language without a writing system, though there exists a dictionary in circulation, most likely written out phonetically in Rieze Maxian. Only the elite of the Long Dau tribe are allowed to speak it, but Gaius has learned the language thanks to Wingul. Rowen also studied some of it when he was young. They are the only ones who can still speak it. Long Dau, like Melnics in Tales of Eternia, is based on English. It basically takes English phonemes and replaces them by others to create a unique-sounding language. As it was created for a Japanese audience, the official Xillia guides all use katakana in their conversion tables, and Melnics guides and Long Dau translators on the internet have been simply romanizing this katakana, from what I have seen so far. I have tried to come up with a system that would be a little closer to English, though with a couple of borrowings from some Japanese romanization conventions, which I will explain here. It's only my personal system, though, so if you prefer another, feel free to ignore this. This is the chart I am personally using. English is in pink and Long Dau is blue. How to form a word in Long Dau? All you have to do is take a word in English and replace the letters with their equivalents. What’s the matter with “n’”? The Long Dau sound of the English E is a syllabic n, like the Japanese ん/ン. The apostrophe serves to indicate it is different from the n that replaces the English V.
What’s the matter with those “(u)”? The u is used before other consonants, but is replaced by a vowel when followed by one. Since a consonant (l) is following the first l, the u is kept. But the second l is followed by a i, a vowel, so the i replaces the u. The u is usually dropped at the end of a word, or when consonants can flow well together, but usage may vary. What’s the matter with “ji”? Following the rule explained above, the English word “do” would logically become “di” in Long Dau. However, the Long Dau di is used for the English R. In Japanese the difference is made by writing DO ヂ and R ディ in katakana - the former being pronounced like “djee” and the latter like “dee”. What to do with double vowels? The simplest thing is probably to simply write the vowel two times, but that has a tendency to make words longer. For that reason, I recommend the use of a diacritic sign (accents etc) to indicate one vowel is supposed to be there two times. I personally use macrons (ū), but all sorts of marks can be used depending on what’s available on your keyboard: ù, ú, û, ü, ũ, ů, etc. For those who have no way to make those signs easily, I propose using an apostrophe like with the n’: u’. Or just simply double it: uu. The distinction is important especially for I/u, as “u” is used for most consonants, but also for C/wa, W/ba and Y/ya when followed by H/a; R/di and T/ti when followed by O/i; and Q/yo when followed by U/o. It helps make the distinction between two similar words. “chat”: C→wa, H→a, A→e, T→ti = “waaeti”, or “wāeti”, “wa'aeti”, etc. Names and Elympion words stay the same. You say “Milla” and “spyrix”, not “Tūlule” and “spuyadiuz”. “Booster” and “Link” exist in Long Dau, however: “Bīstin’di” and “Lūmuk”. Keep sentences as simple as possible. What matters for the meaning is the given translation, not the actual English rendition of the Long Dau. That’s because turning everything into Long Dau would make sentences way too long and confusing. For that reason, the Long Dau part should use short English words as a base (for example, use “see” instead of “visualize”, “good” rather than “delicious”, etc.) and not contain all the information if there is too much. The true message can be conveyed in the translation in subtitles or your fanfic’s author notes. The guides also say that we can drop syllables to shorten words (ex. “wāen’” instead of “wāemuwan’” for “chance”), but don’t give rules for it. It could be treated like a kind of slang. Contractions do not require an apostrophe (which we are already using for n' anyway). So “I’ve” would be “Unun’”. Although, the guides recommend to not use contractions (and so use “U aenun” - “I have” instead). “Baiba!” (“Wow!”) is a handy word that Long Dau (and Melnics) speakers seem to use to convey various emotions, like surprise, excitement, etc.